We are proud to be in Vincennes, the heart of watermelon producing counties in Indiana. In case you are unfamiliar with watermelon production here, Indiana is just behind Florida, Texas, Georgia, California and South Carolina in watermelon production nationwide. Indiana has more than 7,000 acres of watermelons valued at over $30 million value. In the recent Watermelon Research and Development Group (WRDG) annual meeting, the group that comprise members from academia, government and industry discussed watermelon varieties. In this article, I will summarize my notes from this year’s meeting and discuss the varieties we tested in Indiana watermelon variety trials in 2016. One of the interesting things I learned in the meeting is from a talk by Mr. Greg Hitt from Walmart. He shared data that shows Walmart increased the sale of mini watermelons by 21% in the past 52 weeks. The sale of mini-watermelons and traditional seedless watermelons do not compete with each other. They are purchased by 2 different types of consumers. If this is a general trend, it is likely we are going to see a continuous increase of mini watermelon market. The group agreed that the ideal size of mini watermelons is about 6-7 lbs. Interestingly, Mr. Greg Hitt pointed out he had observed traditional watermelon growers fail to produce mini-watermelons. One of the challenges is the difficulty in deciding when the fruit are ripe. Last year, we evaluated four mini-watermelons (Extazy, Krimson Kiss, Ocelot and Serval) in our variety trial. Determining the maturity of the fruit is indeed a challenge even for our most experienced crews. Among the four varieties, Extazy and Krimson Kiss had high yield. But these two varieties tend to have large fruit. Krimson Kiss is superior in sugar content. The collaboration of the seed industry and academia to evaluate varieties in major production areas is one of the best success stories of the watermelon industry. Varieties that stand out in this year’s trial and consistently perform well in Indiana include Premont (majority 45-count), Excursion (majority 36-count), Traveler, KB12106 (very uniform fruit size at 45 count) and Exclamation. A few other varieties that yield well in Indiana as well as in Kentucky and Delaware in 2016 are Talca (dark strip), Crunchy Red and Wolverine (majority 45-count). For growers that primarily market at road stands and farmers markets, outstanding fruit quality and uniqueness often attract consumers. Unfortunately, varieties that have the high sugar content tend to have low yield. Poseidon, Road Trip, Secretariat and Joy Ride are a few varieties that have high sugar content and also maintain satisfactory yields. There are a few varieties that have unique rind patterns, which might attract consumers in some markets. One of the varieties is Wayfarer (Figure 1A); the blocky-round fruit fall in the 10-18 lbs category. The very dark green rind and occasional faint stripe separate Wayfarer from other varieties. Wayfarer was one of the top yielding variety in the 2016 Indiana trial. The fruit have firm flesh and good sugar content. Prime and Chubbiness are two varieties from an Asian seed company Known-You who are new in the U.S. Both varieties have unique rind patterns. They are oval- shaped; the fruit range in size from 10 to 17 lbs. Prime (Figure 1B) has a bright dark green rind with faint tiger stripe, soft flesh and moderate sugar content. Chubbiness (Figure 1C) has a very dark green rind, almost like Black Diamond and is high in sugar content and has a moderate-low flesh firmness. However, yields of both Prime and Chubbiness are in the lower range. Another two varieties from the same company also have unique rind patterns: 3F-4139 (Figure 1E) and 3F-4221 (Figure 1F). These two varieties have basketball-size fruit with light green rind and thin and dark green strip. 3F-4221 has yellow flesh with very high sugar content. We are very excited to see a spotted type seedless watermelon in the trial: KB 15010 (Figure 1D). The plant has moderately to high yield but low in sugar content. 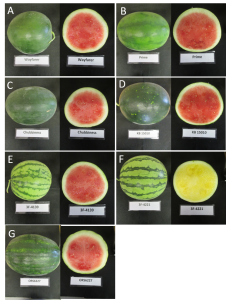 Another interesting watermelon is ORS6227 (Figure 1G) from Origene seeds. It has a dark green rind with light green strips. Instead of a smooth rind, it has bumps which extended from the blossom end to stem end. ORS6227 is moderate-low in yield and low in sugar content. Mr. Greg Hitt also told the group that the sale of seeded watermelons accounted for about 10% of total watermelon sale in Walmart. Seeded watermelon plants can serve as pollinizers for growing seedless watermelons. The benefit is that both seeded and seedless watermelons can be harvested. However, Dr. Jonathan Schultheis’s study showed that yield of a seedless watermelon with a seeded watermelon variety as the pollinizer had lower yield compared with yield of seedless watermelons grown with specific pollinizer plant. With that said, growers probably should only consider use of a seeded watermelon for pollinizers when they know they have a market. Dr. Schultheis’s also shared his promising results about SP7, a new pollinizer from Syngenta. It outperformed SP6 in increasing yield of a seedless watermelon. One of the things that has made us proud this year is Dr. Dan Egel was recently selected as the vice-president of the Watermelon Research and Development Group (WRDG) in Mobile, AL. This is a group comprised of members from academia, government and industry, both nationally and internationally. Congratulations Dan!